Summary: Just because you’d give your best friend everything doesn’t mean she has to take it. As Danielle wrestles with this major life decision, she finds herself torn between being true to her best friend’s wishes and being honest with herself. Parenting issues aside, Smidge’s small-town Louisiana world is exactly the one Danielle made sure to escape. Danielle isn’t one for playing the social butterfly, or being the center of attention. And when your best friend tries to set you up on a date night with her husband, it might be time to become the bossy one for a change. I'll be the first to admit that when I read the first three paragraphs of the description for YOU TAKE IT FROM HERE by Pamela Ribon, I wasn't entirely sure I wanted to read this book. While a part of me was tempted by the story, I just had a feeling that it might be a little over-the-top. A book about a dying woman whose last wish is for her best friend to basically replace her as a wife and a mother, seriously? However, that last little paragraph sealed it for me when it mentioned that YOU TAKE IT FROM HERE is "in the spirit of Beaches and Steel Magnolias." I love it when a book can move me like those movies did, so I figured I would take a chance. I am happy to say that I really enjoyed YOU TAKE IT FROM HERE. In case you're wondering, was the comparison to Beaches and Steel Magnolias accurate? My answer is a resounding, "YES!" As was the case with both of those movies, this book touched my heart over and over again and I most definitely sobbed. I even managed to read this entire book in one sitting so that says something about how much I was pulled into this story. YOU TAKE IT FROM HERE tells the story of two long-time best friends, Danielle and Smidge. Danielle is fresh off of a divorce and can't wait for her yearly vacation with Smidge; however, their fun soon takes a quick 180 degree turn when Smidge announces that her cancer is back.. and it's terminal. As if that isn't shocking enough for Danielle, Smidge makes one last request of her. She asks Danielle to take over her life as a mother and wife. Of course, Danielle loves her very spunky friend and wants to help, but can she really just assume Smidge's life as well as drop everything she's ever worked for? If you are a frequent follower of my blog, then you already know how much I adore books that focus on the beauty of female friendships. And that was one of my absolutely favorite things about YOU TAKE IT FROM HERE -- that it showed the ups and downs of Danielle's and Smidge's friendship. I loved how these two women interacted with each other, and their dedication to their friendship was incredibly heart-warming. Having said that, I'm pretty sure that I would never ask my best friend to take over my life after I died; and I'm almost positive that I'd never step in for one of my best friends if she were dying. But, oh how I envied these two women for having such a strong relationship and even considering the sacrifice for each other. Another wonderful thing about YOU TAKE IT FROM HERE was the writing. 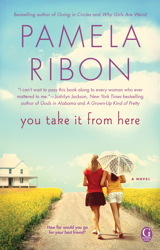 I had never read anything by Ms. Ribon before, but since finishing this novel, I've been trying to get my hands on more of her books -- one was even selected as an Oprah.com Book Club pick. I loved how easy this book was to read. The prose was simple, yet powerful; and there is no doubt that Ms. Ribon has major skills for writing with emotion. What did surprise me about this book, though, was how much humor Ms. Ribon infused into this story. Smidge was a piece of work -- you might even say bossy, and Danielle's reactions to her were definitely worthy of some smiles. I'm sure you can already tell, but YOU TAKE IT FROM HERE would make a fantastic book club selection. There is a reading guide available with fourteen thought-provoking discussion questions. Many of these questions deal with Smidge and Danielle's personalities as well as their friendship. However, there are other themes including parenthood, divorce, relationships, love, sacrifice, secrets, and commitment. I enjoyed YOU TAKE IT FROM HERE a great deal, and I recommend it to those of you who did love Steel Magnolias and Beaches... and even Terms of Endearment. (Sorry for not being more original.) It is a beautiful story about what it means to be a best friend and it's guaranteed to touch your heart. Thanks to Rare Bird Lit for providing a review copy of this novel. Glad to see this book worked for you even if the premise gave you pause. I admit I would have the same thoughts about the premise. I can't imagine asking someone to replace me since I think Carl would have a say so in that too. I still think the book sounds wonderful! Thank you so much for such a thoughtful, positive review, and for the comparison to Terms of Endearment -- a movie close to my heart. Sounds like an excellent beach book! I wasn't so sure about this one from the premise -- sounded too sad -- but your review has definitely piqued my interest! Explorations of female friendship always get me, too. I totally would have thought it would be hokey from the description. I love those friendship movies though, so on that basis I could see reading this one. i don't know if i would have picked this book up either from the synopsis, but i'm so glad to hear that you enjoyed it! i'm definitely interested in this book now. I am glad that in spite of your initial hesitation, you read You Take It From Here and enjoyed it. This is the first time reading a review for the title, so thank you.